Get your familiar Microsoft Office experience across devices-Windows, iOS, or Android-with Microsoft Office 365 and Office Online. Easily access and work on your latest files with Microsoft OneDrive for Business in Office 365. 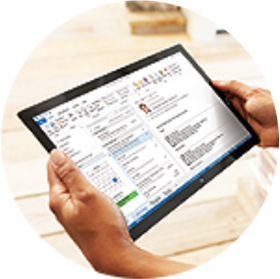 Access the latest customer data with Microsoft Dynamics CRM Online. Get more done with Microsoft Windows 10 PCs that offer faster boot times, improved responsiveness, and the Battery Saver feature, designed to provide longer battery life. Access business applications hosted in the cloud-like CRM, finance or HR apps-on any device using Microsoft Azure RemoteApp. Exciting new touch-enabled Microsoft Windows 10 PCs and devices, including Surface, Lumia, and a range of other brands. 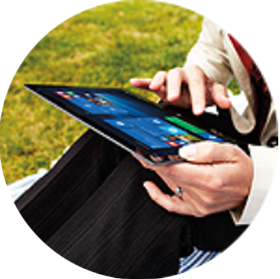 Windows 7 users get up to speed quickly with a familiar experience in Windows 10. Windows 10 Continuum transforms "on the fly" between tablet and laptop mode. 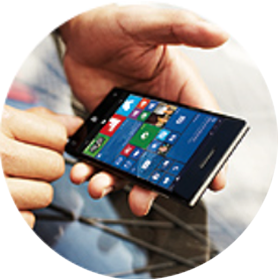 Built for touch, Microsoft Office Mobile apps are designed to work great with Windows 10 devices. Schedule meetings with Microsoft Office 365 and connect in real-time with online video conferencing using Microsoft Skype for Business. 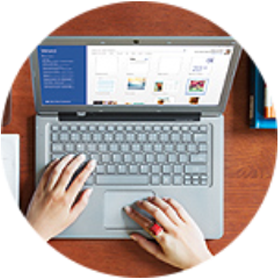 Work together simultaneously to revise documents, using Office Online in a browser or with Office desktop apps. Stay "in the know" with consistent, interactive dashboards and reports using Power BI on mobile devices. Easily create private social networks using Yammer to stay connected and make faster, better-informed decisions. Easily manage personal and company-issued mobile devices with tools built into Microsoft Office 365, Microsoft Windows 10, and Microsoft Enterprise Mobility Suite (EMS). Provide employees a simpler, more consistent way to access all their applications, websites, and devices with a single sign-on using EMS. Easily attach encryption and rights management rules to business data to help prevent unauthorized access and use with EMS and Enterprise Data Protection in Windows 10.